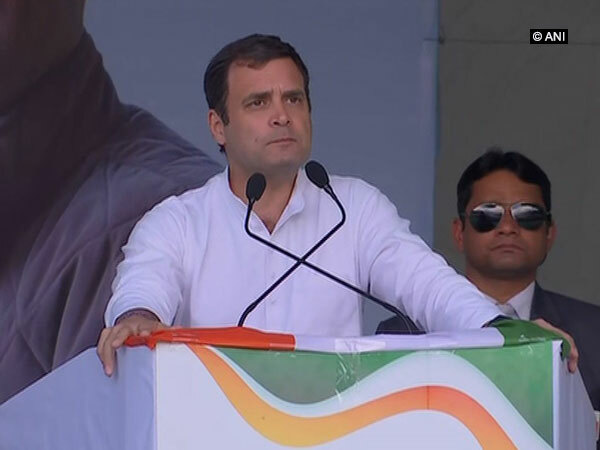 Kangra (Himachal Pradesh) [India], Mar 7 (ANI): Congress President Rahul Gandhi on Thursday accused Prime Minister Narendra Modi of politicisng the Pulwama terror attack. Kangra, (Himachal Pradesh) [India], Feb 21 (ANI): Union Human Resource Minister Prakash Javadekar and Chief Minister Jai Ram Thakur laid the foundation stone of Central University of Himachal Pradesh at Dehra in Kangra district on Thursday. Kangra (Himachal Pradesh) [India], Feb 16 (ANI): Union Minister JP Nadda on Saturday claimed that the Army has been directed to take appropriate action with regard to the ghastly Pulwama attack that took place on Thursday. Kangra (Himachal Pradesh) [India], Feb 7 (ANI): Himachal Pradesh Chief Minister Jai Ram Thakur on Wednesday flagged off a new express train between Baijnath Paprola to Pathankot from Baijnath-Paporla railway station. Mandi (Himachal Pradesh) [India], Jan 1 (ANI): At least ten people were injured after a jeep rolled down a hill on Chhatri-Gatu road in Mandi district on Tuesday. Kangra (Himachal Pradesh) [India], Oct 24 (ANI): Spanish paraglider Jose Lewis, who was found in Palampur after being missing for several days, was rescued here on Wednesday. Kangra (Himachal Pradesh), [India], Oct 23 (ANI): Kok Choonk Na, a paraglider of Singaporean descent who was missing since yesterday was found dead on Tuesday in Bir Billing hills of Kangra valley. Kangra (Himachal Pradesh) [India], Oct 12 (ANI): At least 100 cases of dengue have been confirmed in Himachal Pradesh's Kangra district till October 10. Kangra (Himachal Pradesh) [India], July 31 (ANI): A mild earthquake measuring 3.1-magnitude on the Richter Scale hit Himachal Pradesh's Kangra district on Tuesday. Kangra (Himachal Pradesh) [India], July 18 (ANI): MiG-21 fighter jet of the Indian Air Force on Wednesday crashed in Himachal Pradesh's Kangra district. Shimla (Himachal Pradesh) [India], July 3 (ANI): During the past 24 hours, Chamba, Kangra and Mandi districts here have received heavy rainfall.